FRESH Premium Frozen Yogurt. Such a bold name to take on when serving anything that pertains to food. 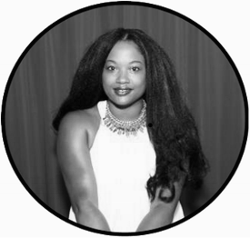 It requires that you deliver newness with high value and quality each and every time, without compromising the integrity of the business. 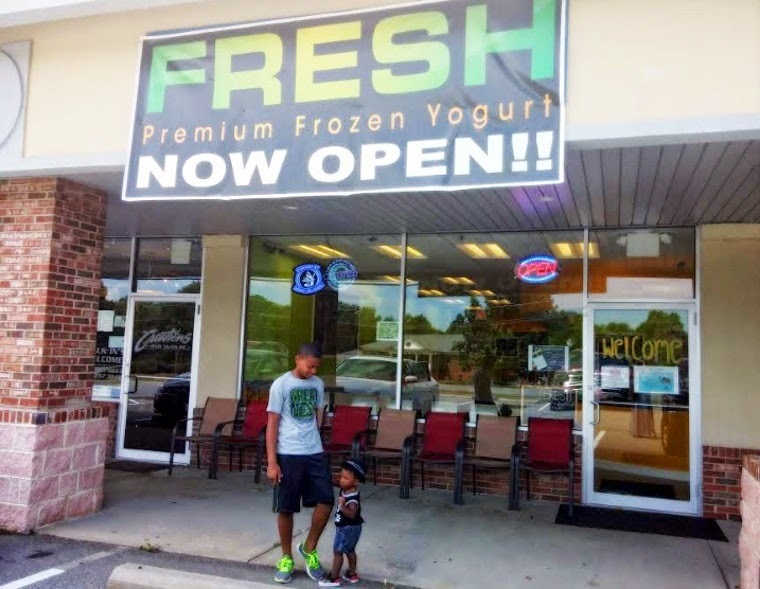 I believe FRESH, located at 10072 Southern Maryland Blvd. 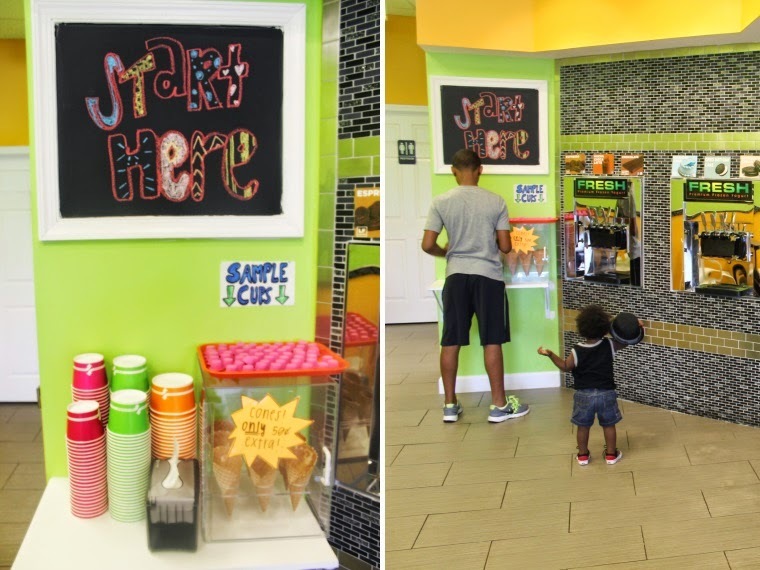 in Dunkirk, MD in the Country Plaza shopping center, is serving up a recipe for success. My boys and I had the pleasure of visiting FRESH the other day. It wasn't our first visit there. We have stopped in a few times before, but never took the time to really get to know all that FRESH has to offer. The kind people at FRESH gifted us with a certificate so that we could try out some of their frozen yogurt and variety of toppings. We kindly took them up on the offer. 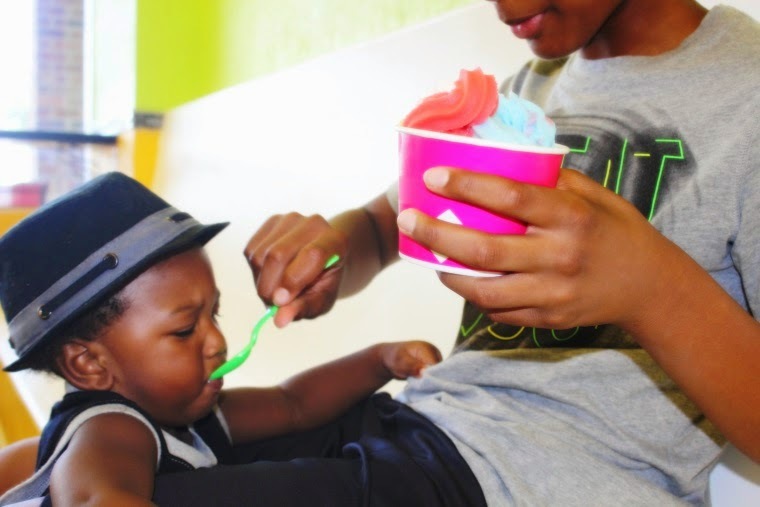 FRESH Premium Frozen Yogurt started as just a guy with what he thought was a pretty unremarkable idea - to provide the best frozen yogurt with the best ingredients. It sounds simple, right? We thought so, too. 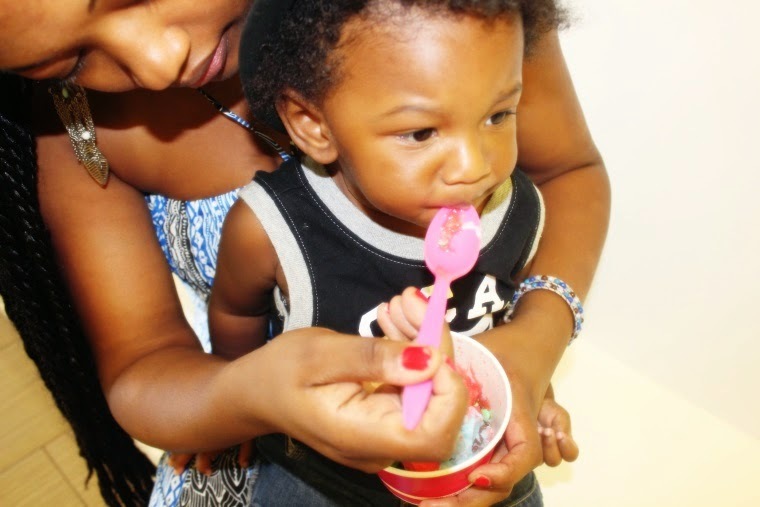 And this is why we want to change what you expect from frozen yogurt. Well, as it turns out doing things the right way isn't necessarily the easiest way. Countless trips to farms, sourcing ingredients, and then tasting again and again (OK that part isn't really hard) only reinforced that we were on to something. Fresh, natural ingredients just taste better. There's no amount of added sugar or unpronounceable preservatives that make up for farm fresh quality. We believe that if we source the freshest, brightest flavors, we can't go wrong. This philosophy is what FRESH Premium Frozen Yogurt is built on, and why we think you'll keep coming back. Upon entering FRESH, you will notice how bright the place is. The walls are covered with a vibrant green and orange color. There are white chairs and seating options to accessorize the place. 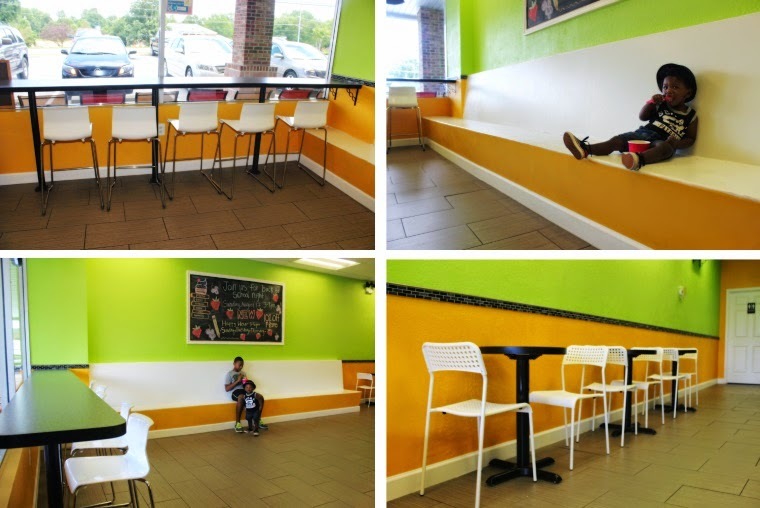 The tiled wall where the frozen yogurt machines are housed is a great addition to the space. A huge chalkboard is nicely decorated with a little "FYI" for customers to get a glimpse of immediately. There is a lot of openness and cleanliness. It is reFRESHing to the eye. 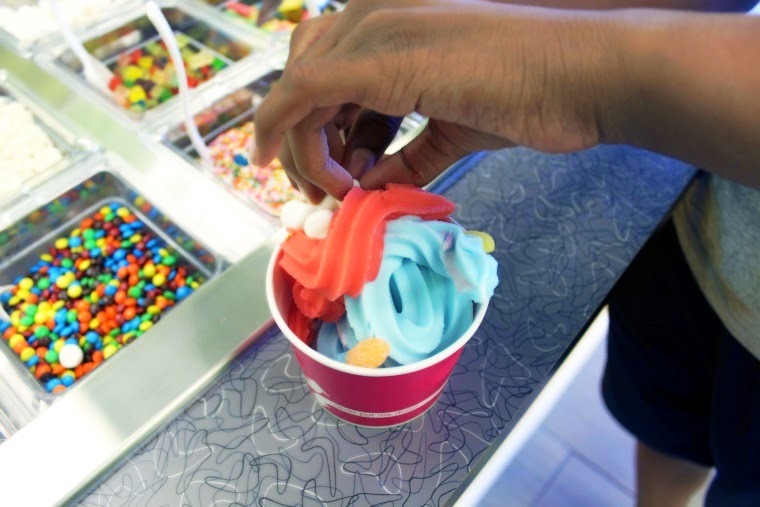 The process is simple to get your hands on this frozen yogurt goodness. You can sample the flavors before making your decision. The sample cups are located beside the other cups. You can opt to put your frozen yogurt in a waffle cone for an additional amount. I believe there are 12 flavors available. You can choose to enjoy them separately, or mix them for a great combination of flavor. 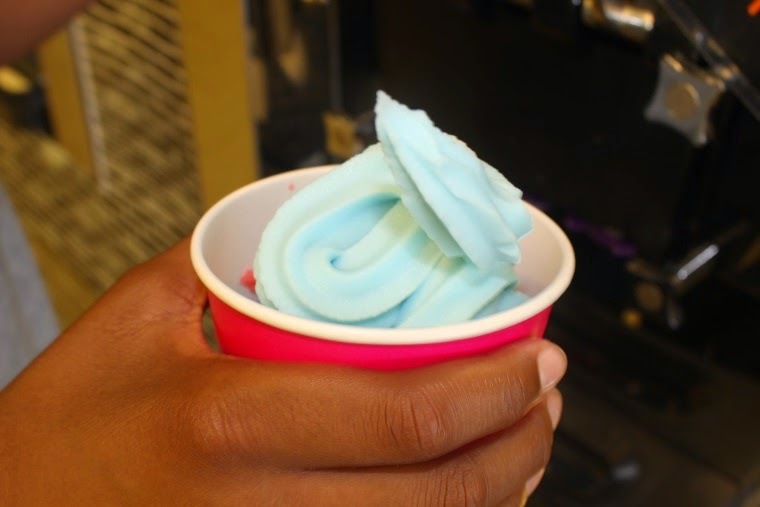 FRESH recently introduced Judy's Blue Daiquiri Sorbet. It. Is. Tasty. Both Kaden and I mixed it with Watermelon Sorbet. The toppings are plentiful. There are over 30 of them to choose from. Sometimes, I want to put them all on top of my frozen yogurt, but I practice restraint. I always get the classic sprinkles. 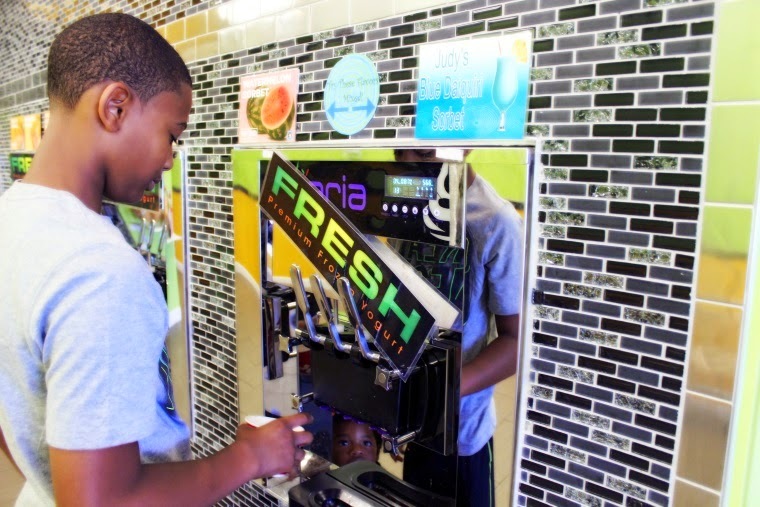 But FRESH offers cool options like Mango Juice Poppers and Fruity Peebles. Try saying that three times, really fast. You can also go for the gooey goodness and add caramel, hot fudge, etc. Toppings are a great way to be creative and allow the little ones to have a choice in the process. They'll love this. Depending on how carried away you got, this is the simple part. Just place your cup on the scale and wait for your total. If you have a cone instead of a cup, there is a plastic holder to weigh it. 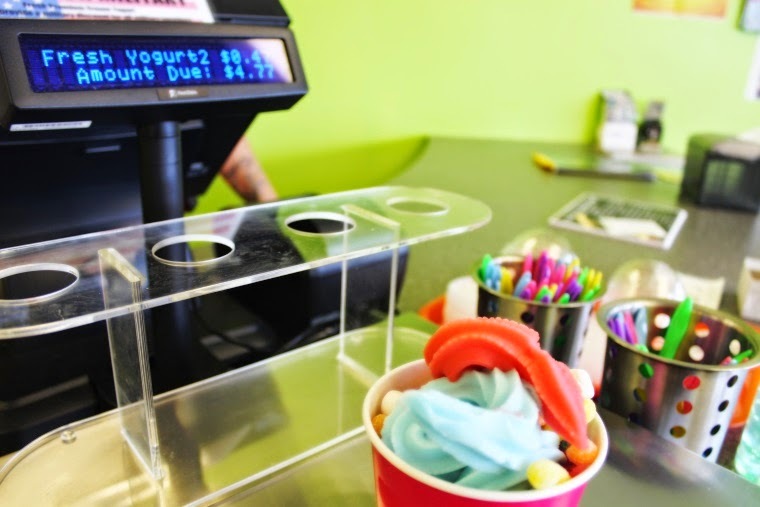 The frozen yogurt costs $.47 per ounce. As you can see in the picture, Kaden's cup came in at $4.77. I always strive to get a in the five dollar range when we visit. I also got a cup that day. Mine was a little lighter. Our total for this trip was just under ten dollars. Not bad for a delicious treat. I guess the final step in the process would be to EAT IT! This took no convincing at all. 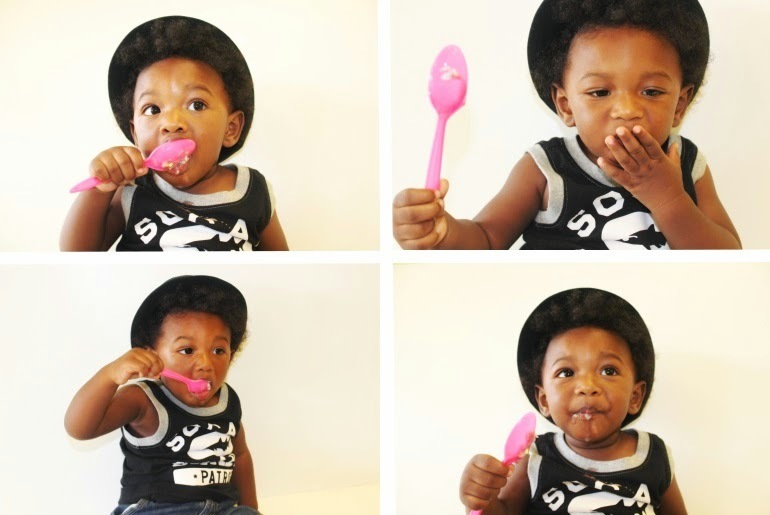 Just look at Liam give his frozen yogurt a lot of love. 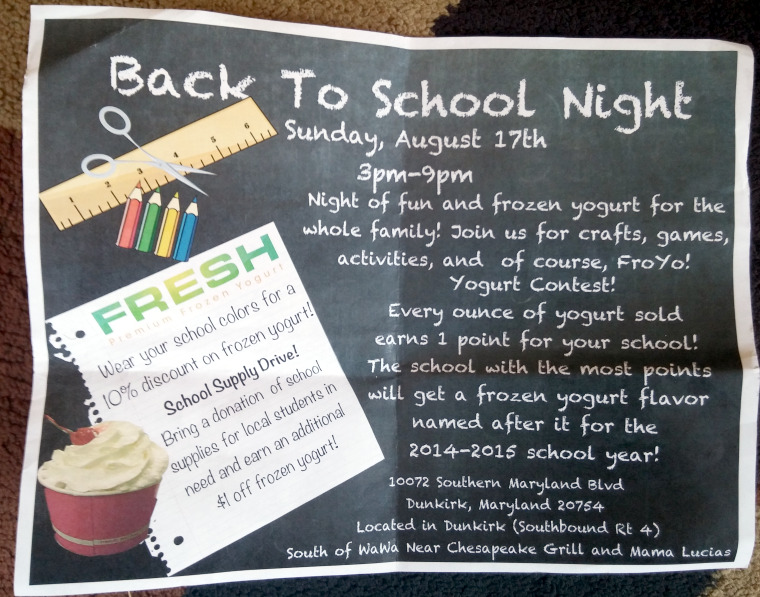 Their upcoming Back To School Night event is scheduled for THIS SUNDAY, August 17th from 3-9 PM. 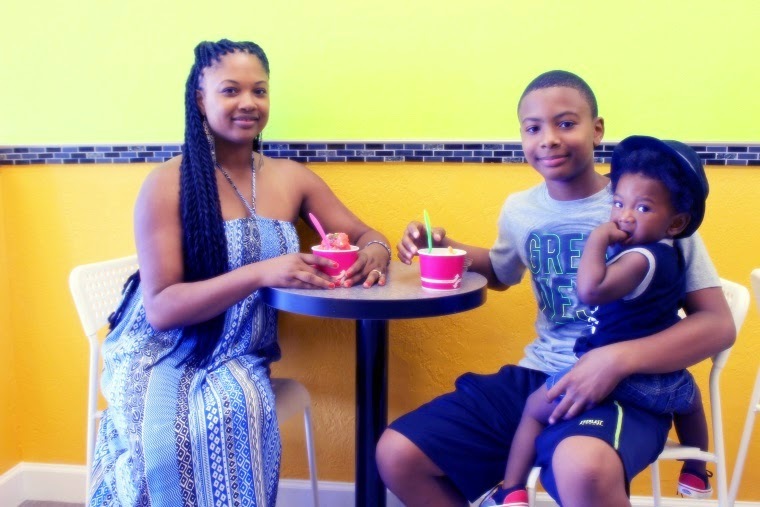 It's for the entire family – crafts, games, activities and a frozen yogurt contest. 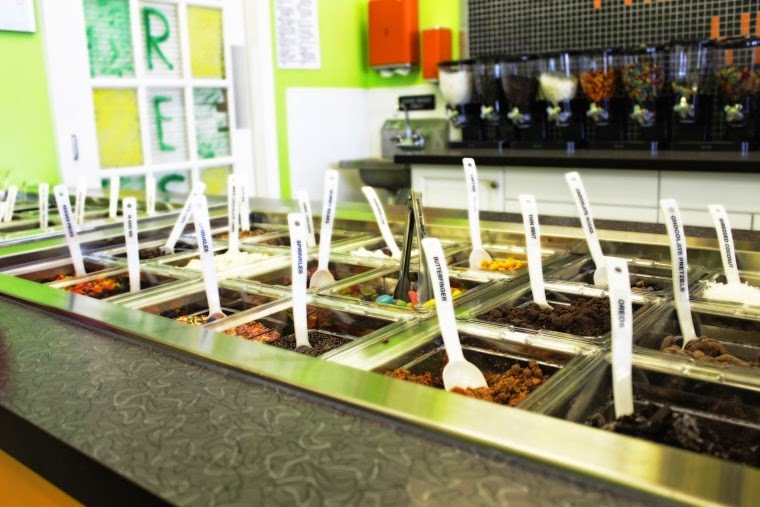 Also, students wearing their school's colors will receive a 10% discount on frozen yogurt. 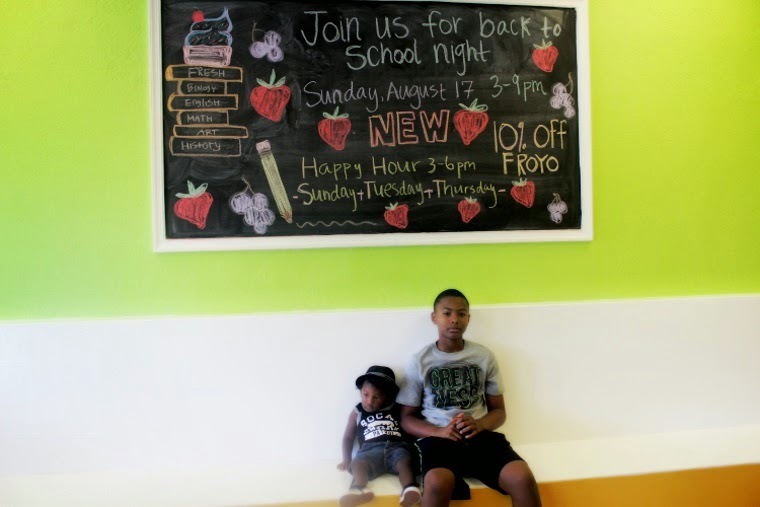 Other guests can bring a donation of a school supply and earn $1 off of their frozen yogurt. Sounds like a night of fantastic fun...and froyo! 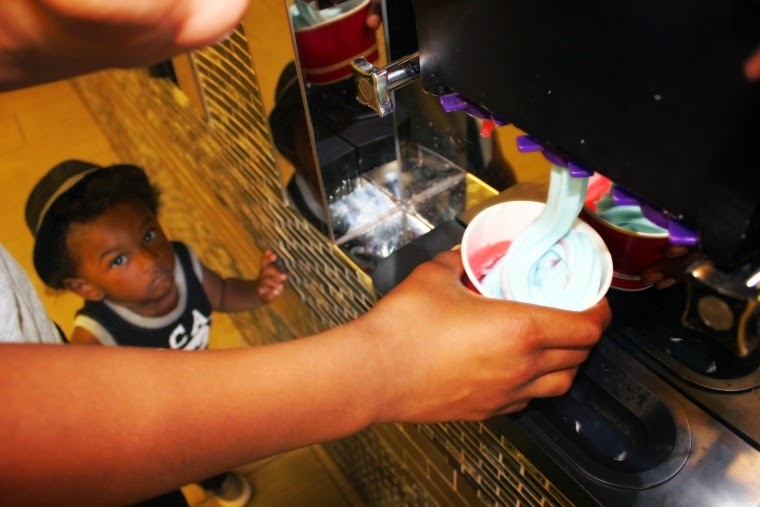 FRESH Premium Frozen Yogurt is always finding away to give back. They support local, just as I do. I think that is why I love this place. Not to mention the fact that it is a good break in the day and a chance to relax with your family and friends. If you are in the area, you have to stop by. Tell them that Keonté sent you. It may not mean much, but at least I'll know that you visited my blog. Ha! 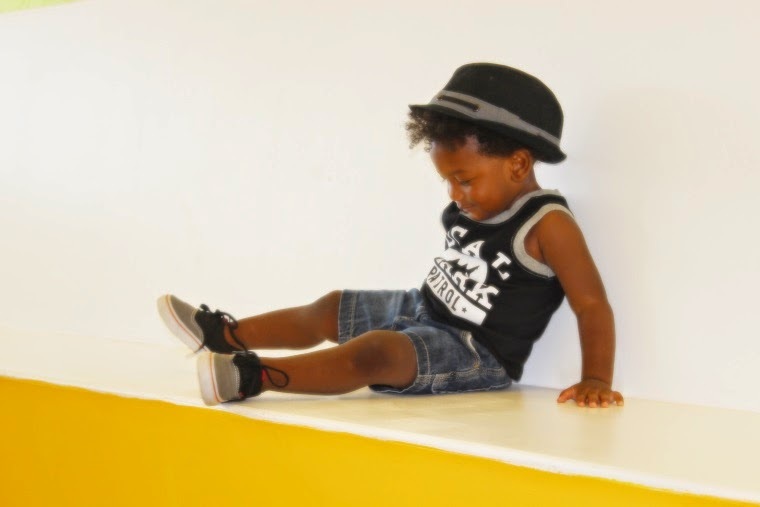 Any place that can tame my toddler, is one worth visiting. 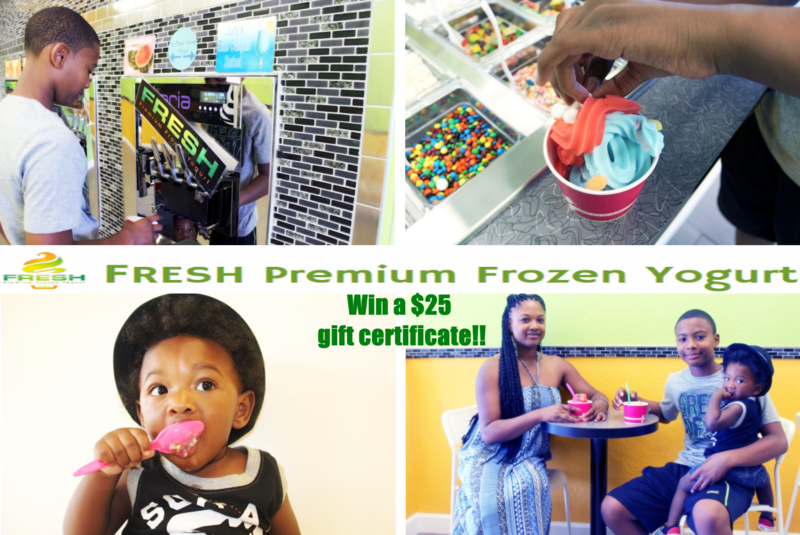 And because I love my readers so much (and FRESH was so generous to offer), I would like to give one lucky person a $25 gift certificate to redeem at the Dunkirk, MD location. FroYo on me! Enter the Rafflecopter form below. If you cannot see the form, enter here. I was provided a gift certificate for my family and I to try out FRESH Premium Frozen Yogurt. The opinions and views are my own.